While Salman Rushdie was speaking at the opening press conference, Iranian publishers were making alternative arrangements to hold their meetings here in Frankfurt. The press conference for the 2015 Book Fair opened Tuesday under high security as author Salman Rushdie arrived to speak about freedom of speech. His presence at the Fair coincides with the publication of his latest novel, Two Years, Eight Months and Twenty-Eight Nights. Last week, the Iranian Ministry of Culture decided to cancel its national stand in protest at Rushdie’s appearance. In 1989, Ayatollah Khomeini, then Iran’s supreme leader, issued a fatwa calling for Rushdie’s death following the publication of his book, The Satanic Verses, which was considered to be blasphemous. That same year, the Frankfurt Book Fair decided to ban Iran until the fatwa was lifted — the Book Fair’s boycott unfortunately did not alter Rushdie’s situation, and Khomeini died without lifting the edict. In 1991, the Book Fair decided to re-admit Iran, and last year, 282 Iranian publishers came to Frankfurt displaying more than 1,200 titles. Freedom of speech is not only under the threat of violence, he said, but political correctness can also be a danger. Rushdie cited as an example the idea of putting “trigger warnings” on books of literature for students in the U.S. in order to signal distressing material. Rushdie did not take questions and immediately left the fair following his speech. On Wednesday, the Iranian national stand in Hall 4.0 was being set up as usual although no books were visible. Various Iranian publishers, both independent and government-affiliated, circled around the official from the Ministry of Culture, Mohsen Amoushahi, who declined to answer questions. 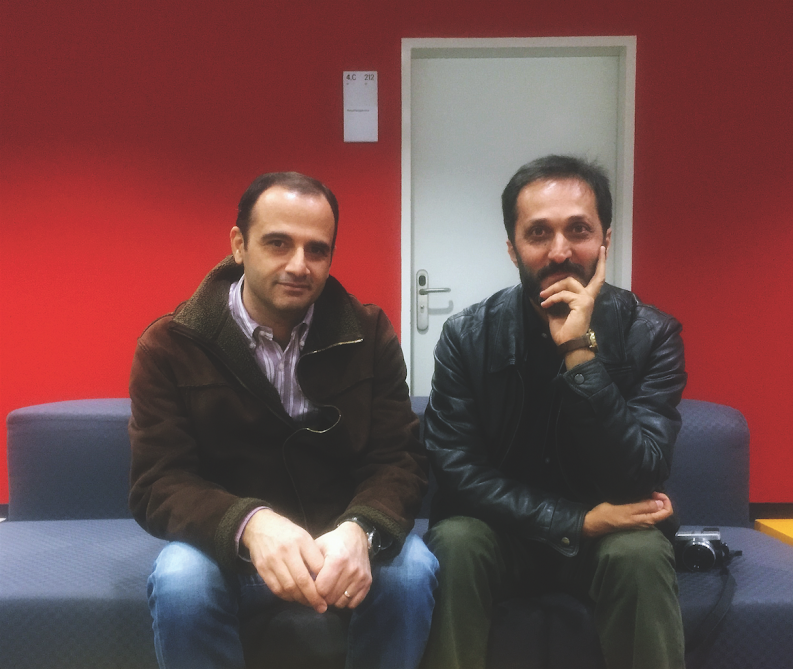 “I don’t agree with the Ministry of Culture’s decision,” said Mahmoud Reza Bahmanpour, Managing Director of the independent Nazar Art Publications, who arrived in Frankfurt on Monday with his distribution manager, Hadi Taghavi. Frankfurt is very important to Bahmanpour, who buys rights and organizes distribution of his publications by Idea Books. He and Taghavi have re-organized their schedules at the last minute and will be meeting with publishers at their various stands but out of precaution will not set up their own stand. “There was no official information so we are in a dilemma about what to do,” he added, suggesting that it was not worth the risk go against the official boycott. That said, Ali Ghoreishi, the international relations coordinator for the Association of Academic publishers in Iran said that some independent publishers and associations under the umbrella of the Cultural Affairs Institute will be setting up their stands, as will children’s book publishers — the Iranian association of children’s book publishers, is a non-governmental organization. According to an Iranian publisher who preferred to remain anonymous, the majority of Iranian publishers asked the Ministry of Culture not to cancel their presence at the Book Fair. “Certain radical elements put pressure on the Ministry of Culture. They felt they had to do something and made a hasty decision at the last minute because certain people had made a mountain out of molehill. We would just like to do our jobs. Now Rushdie is gone, and maybe something will change,” he said hopefully.